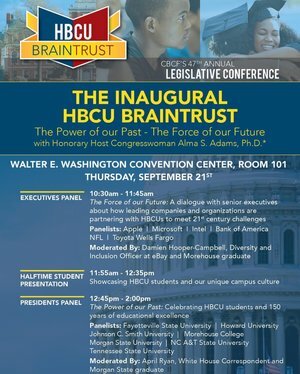 Hosted by Congresswoman Alma S. Adams, Ph.D., this event created a platfrom for undergraduate and graduate students to join forces with HBCU alumni, affiliates, and advocates to showcase the impact of gifts given in time, talent, and treasure during the Halftime Student Presentation. Serving as an HBCU All Star which is a part of the White House Initiative on HBCUs , Tiffany Brockington is among more than 80 students selected from across the country to be ambassadors of their institutions. She appeared on an episode of "The Journey" aired on WHUR. Give it a listen. A recent news article on NPR.org, reveals that HBCUs graduate more poor black students than white colleges.